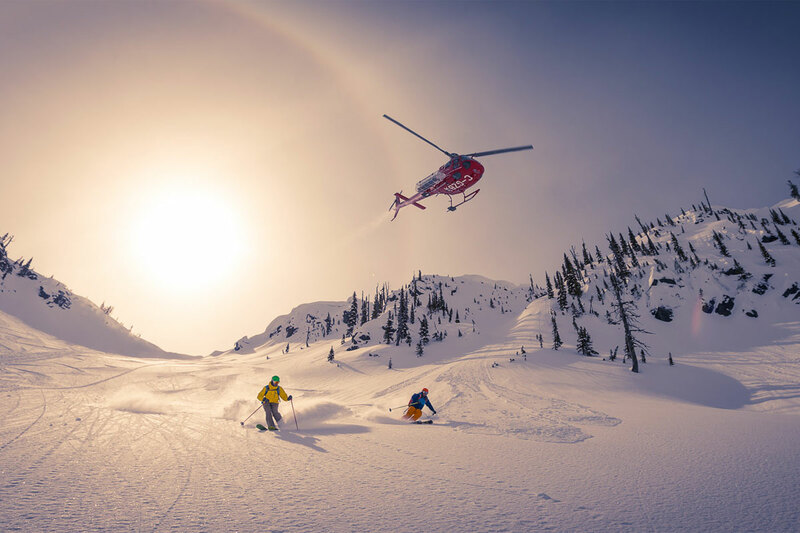 Small group heli skiing is unlike any other type of skiing. It will magnify your entire wilderness experience in the mountains and change your life forever. Every day at Snowwater, three groups of four guests are matched up and privately guided through 150,000 acres of engaging and magnificent terrain. Essentially that equates to volumes of deep powder, choice, juicy lines and no competition for fresh tracks! With only 4 clients per guide, we can easily tailor to specific ability levels and ambitions, maximize terrain use, and foster an intimate, relaxed atmosphere in the big mountains, which increases confidence and individual skill levels. 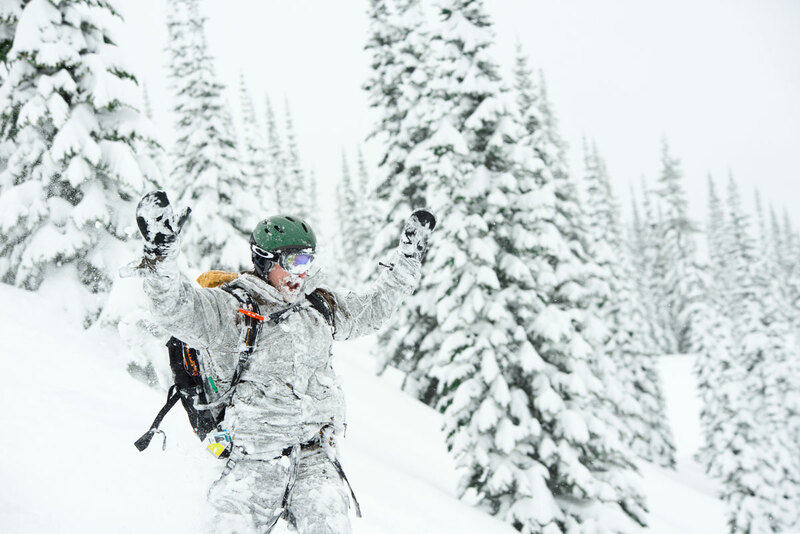 Another important factor of small group heli skiing is the added communication between guide and guests in the field. 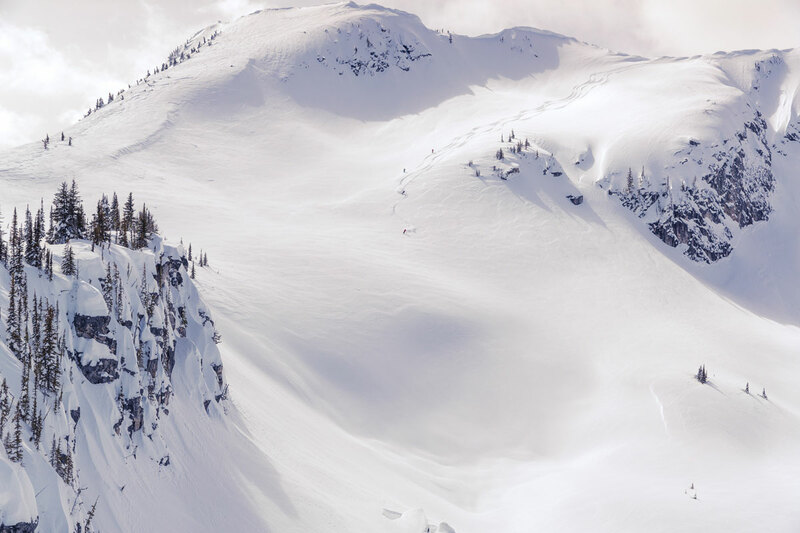 Not only does it allow greater flexibility to explore interesting and unique terrain features, it improves the level of safety in the backcountry. Our sleek, high performance helicopter is a powerful mountain helicopter ideally suited for small group heli skiing. A B2 A-Star Eurocopter, it embodies advanced technology equipment and provides comfortable, quiet cabin room for a guide, four guests and a pilot. A sleek and agile machine, the B2 offers many advantages over large, big group helicopters. Able to fly faster, it adapts and maneuvers easily in big mountains, while safely accessing terrain that heftier helicopters cannot, such as small ridge features and openings. Increased cabin area also permits greater passenger visibility. With only twelve guests a day at our operation, snowcat backup is available for the entire group at a time. 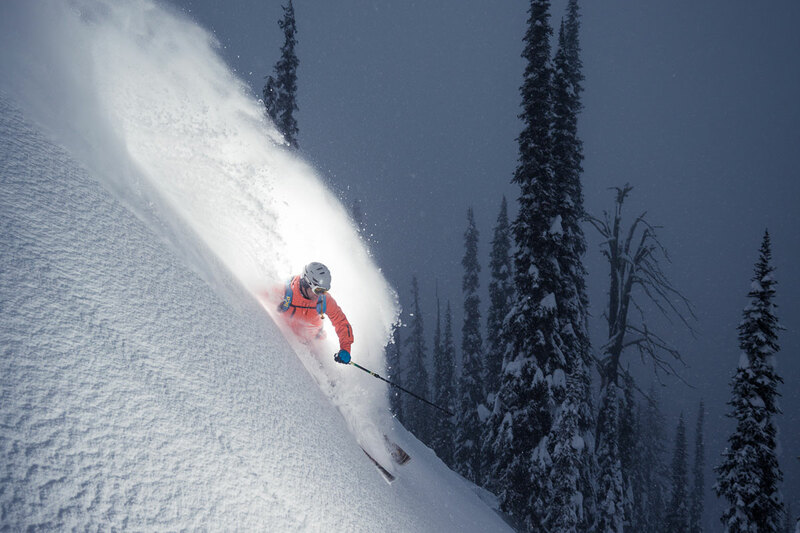 If bad weather prevents flying, our luxurious Ipod- equipped snowcat whisks all guests to steep, deep, world-class glading close to home, so you ski every single day of your ski vacation. Snowwater guests often foster new friendships, both with each other and with staff, and enjoy a more personalized service in this small group, intimate atmosphere. Groups of twelve regularly book the entire lodge and thus have a truly private adventure. 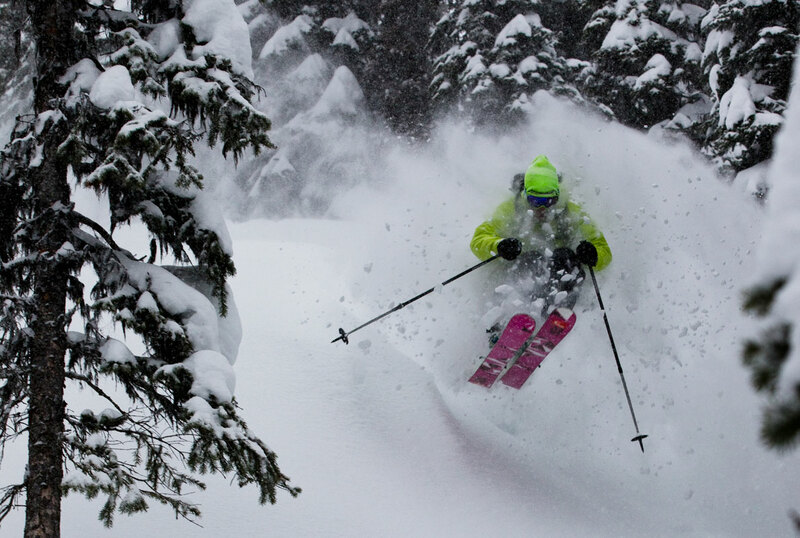 Either way, small group heli skiing is the way of the future. 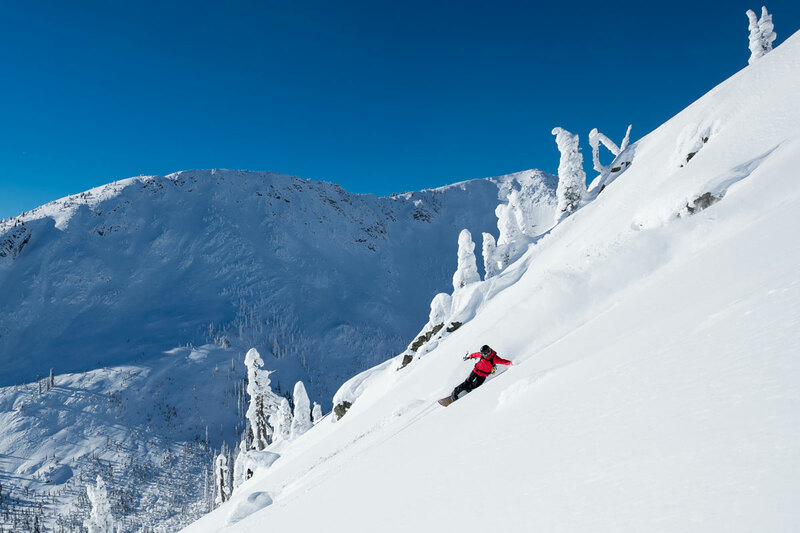 Join us for an all you can ski, powder buffet in the legendary Selkirk Mountain Range of British Columbia. 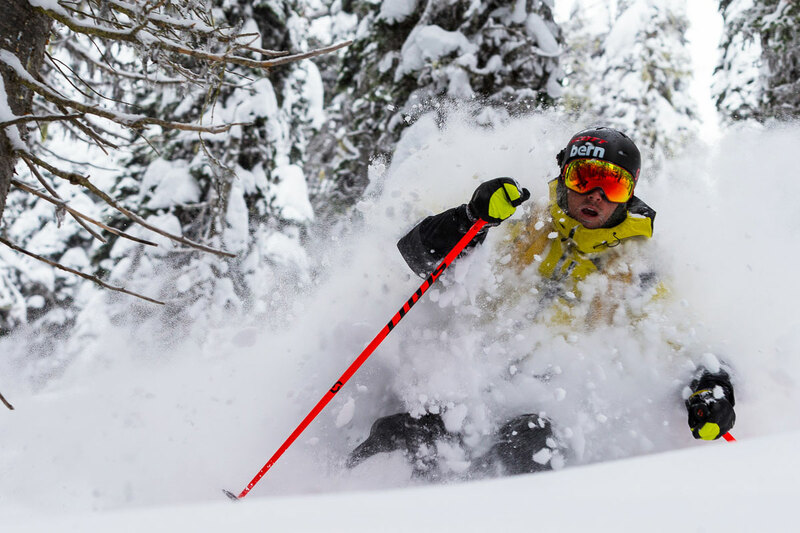 This peak season trip is unparalleled by anyone in the heli ski industry. Designed to leave you wanting for nothing, we have concocted an all-inclusive trip that is guaranteed to bring you back time, and time again. We cater to only 12 clients a day at Snowwater. Skiing in groups of 4, we are able to maximize skiing time on the slopes and avoid long waits for multiple fuel runs, which are often associated with bigger helicopters. Snowcat Backup - Means you ski every day no matter what! A fresh canvas every run! 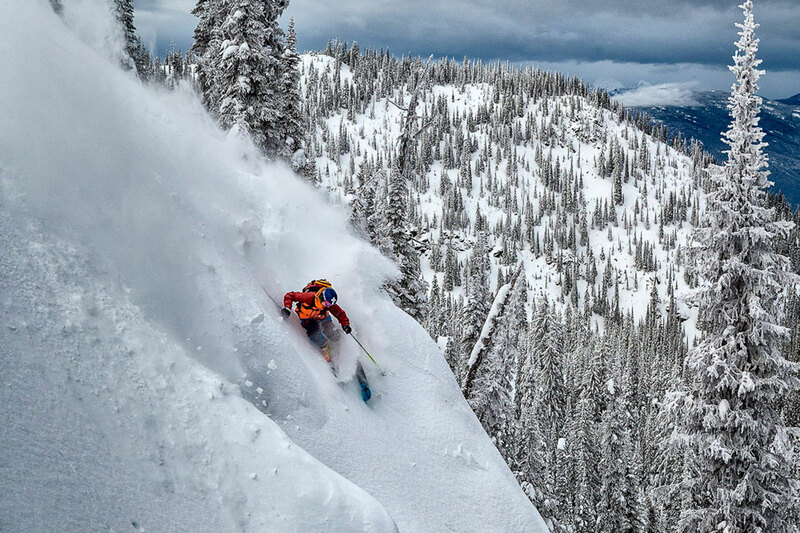 Storm skiing at it's finest! 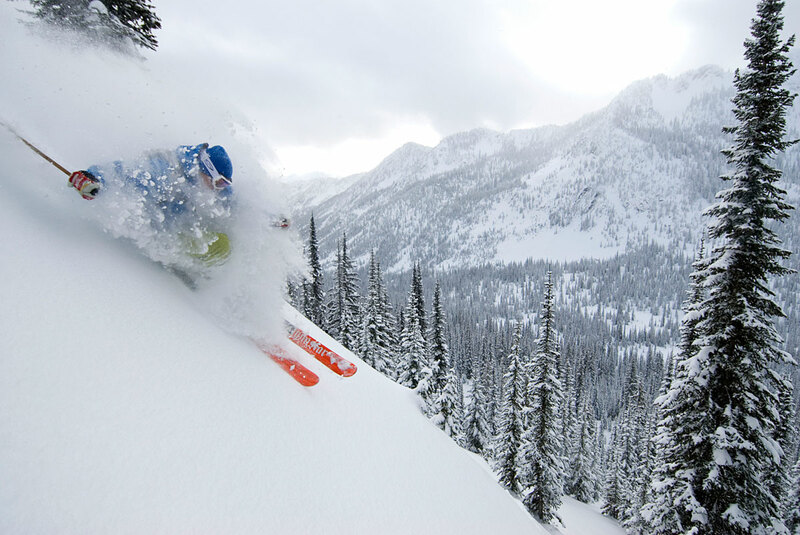 Simply put, we supply the lightest, fluffiest, most consistent stimulant on earth: Kootenay Powder. 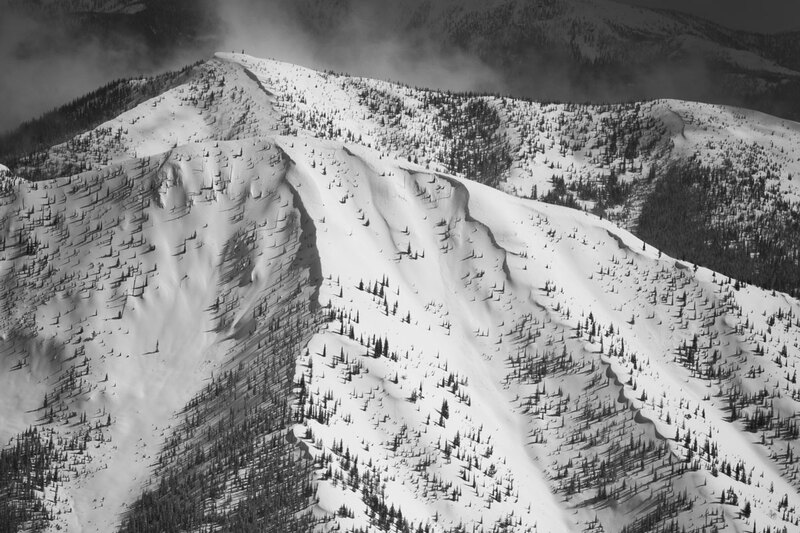 Annual accumulations can amount to 7m (23 ft) at tree line with 9m (30 ft) at higher elevations, offering remarkably deep powder skiing. 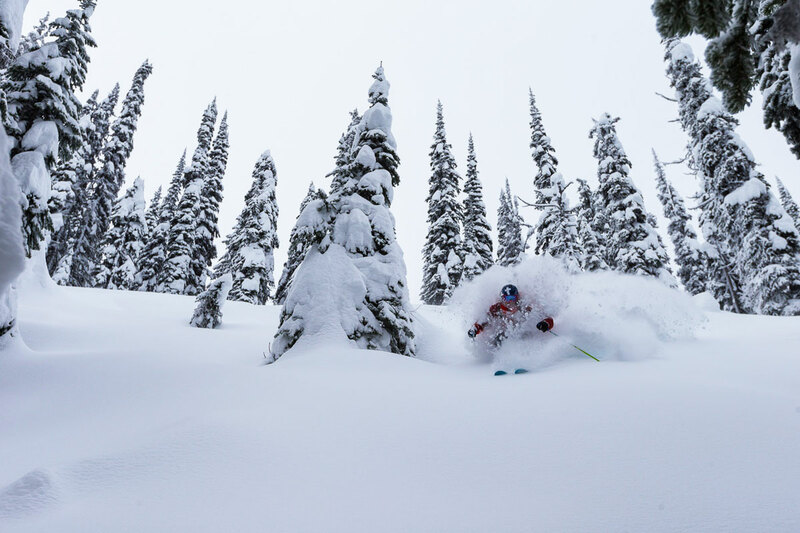 This reliable snowfall often begins in October, serving up early season turns in December and fresh powder well into April. Our temperatures are moderate throughout the season with an average winter daytime temperature at tree line of -7C (20F). Our terrain is exceptional. We operate in three separate mountain ranges of the Selkirk Mountains: the Bonnigtons, the Valkyr Range and the Valhallas. With over 150,000 acres at our disposal, we have plenty of terrain to choose from. Runs vary from 1500 - 3000 feet in length, and offer dramatic alpine ridges, colossal bowls and countless pillow fields to choose from. 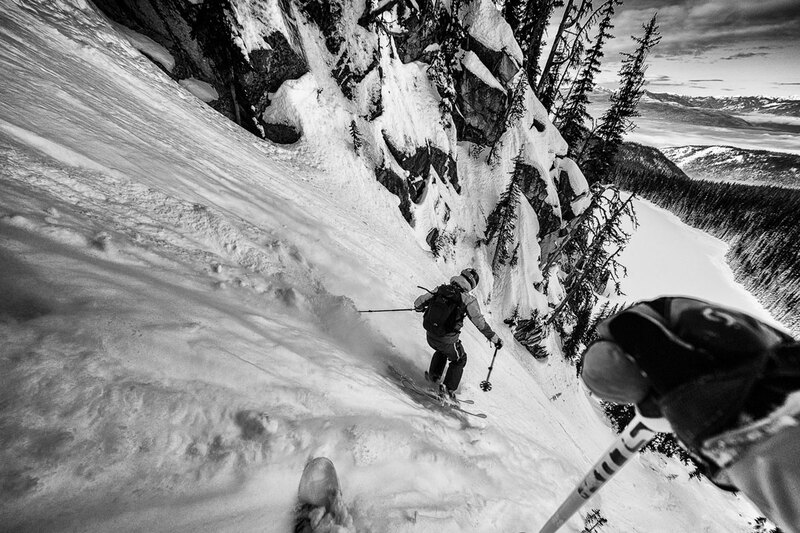 Guests can indulge in steep fall-line old growth descents, chutes flanked by towering granite spires, and perpetual meadows of unbroken powder. We have quick access to both tree skiing and open alpine terrain. 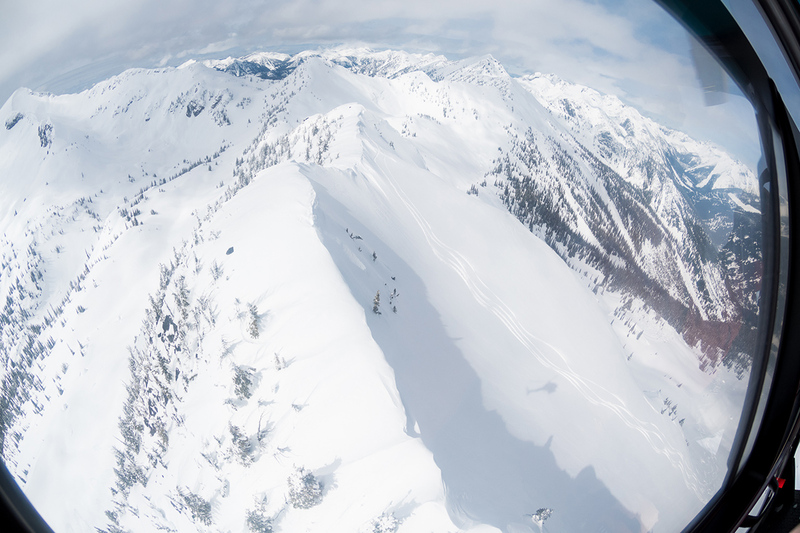 Many of our classic heli ski runs are less than a five-minute flight from the lodge. With only four skiers per group, we are able to handpick terrain and access lines that are best suited to the group’s specific abilities and desires. It is a backcountry paradise. Do you like steeps? We have those. 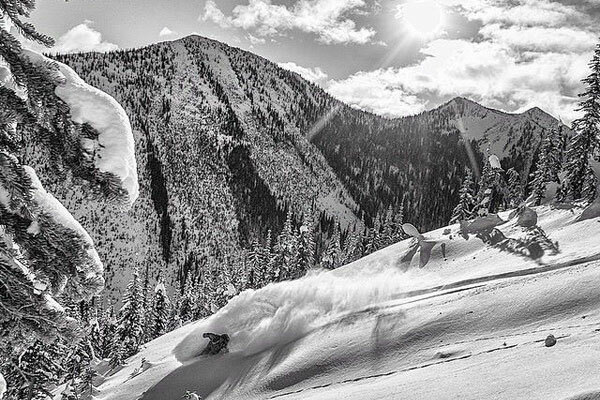 DEEP & Light Kootenay Pow! Snowwater holds the safety of all guests and staff as our main priority. We strictly adhere to industry standards, and hire only competent, certified, professionals with years of specific helicopter experience. All of our heli guides and pilots undergo rigorous annual training procedures. 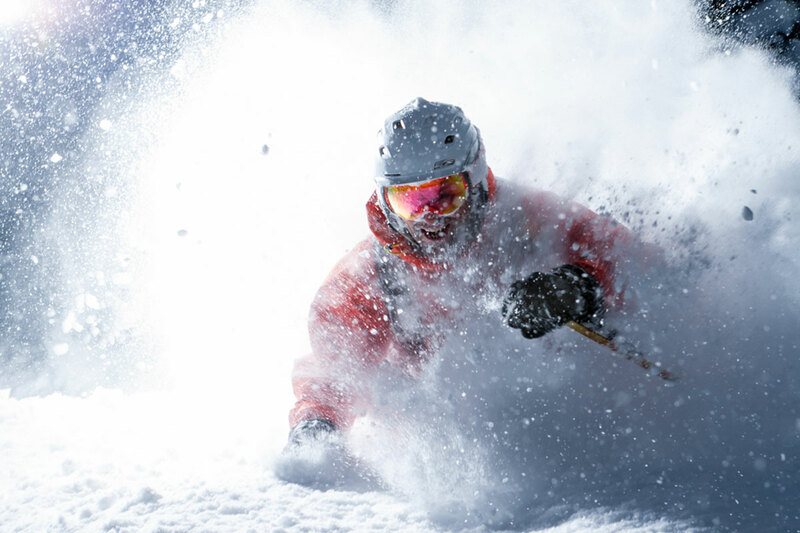 Our guides are AMCG, CAA, and CSGA certified, trained and current in methods of snow safety, weather analysis, emergency medical techniques and mechanized ski guiding. Early each morning, our guides meet to evaluate weather conditions, snow stability and terrain based on field observations and external industry data. Daily decisions are made and often reassessed in the field to ensure optimal safety and fun. At the beginning of each trip, all guests are briefed by our pilot in helicopter safety procedures. Snowwater uses only the B2 A Star helicopter, a high performance, comfortable machine that maneuvers with great agility in big mountains. All Snowwater guests are trained in the use of our digital beacons and avalanche rescue scenarios. 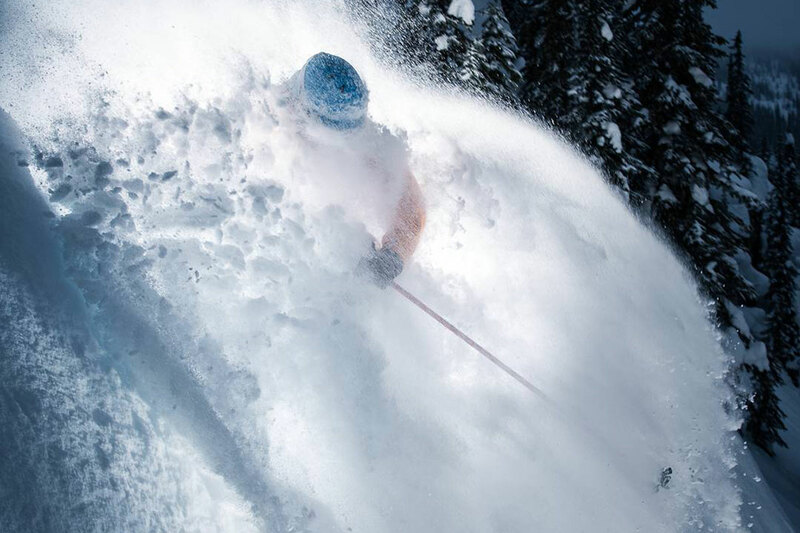 We supply each skier or rider with new Tracker digital beacons and individual safety backpacks including shovel, probe and water bottle, as well as a group radio for added communication. The small group set up, with only four guests per guide, allows for a maximum margin of safety and added attention in the field. As stewards of this land, we have taken necessary precautions to help protect the areas that surround our fuel tanks. We use double-walled Enviro Tanks, essentially a tank within a tank. In case of a rupture from the inside or out, the ultimate integrity of the fuel remains intact. Anti-siphon valves prevent accidental drainage or tampering.